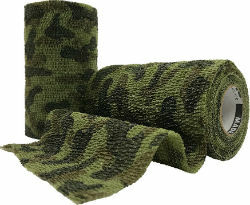 A strong, flexible cohesive bandage ideal for support. For equine or large animal use. High abrasion resistance keeps it from shredding. Strong - 23 lbs tensile strength. Controlled compression will not constrict. Straight hand tear, no scissors needed. Sweat and water-resistant.